(Newser) – Rob Ford is out of rehab, back in Toronto City Hall, and coming clean about his past bad behavior. In interviews with the CBC and CP24, the mayor said his drug use began long before he took office and included pretty much every "drug you can think of," including marijuana, crack cocaine, and magic mushrooms, though he says he has never taken heroin. "I had a disease for a number of years and I was ruining my life, my health was in jeopardy, my job as mayor was very hard to do," he says. I think Rob Ford should have stated, "I've 'abused' (not used) almost all drugs". 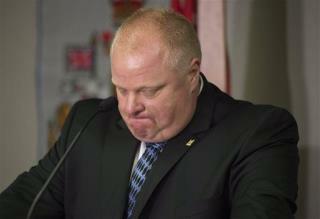 "Rob Ford: I've Used Almost All Drugs" and his actions and comments show it ! Ford - "I've used almost all drugs" Me too. At one time, or another. I admit it. Why, is this bad? Course I put them down At the end Of the day And walked Away. No way! Way. I only speak way.